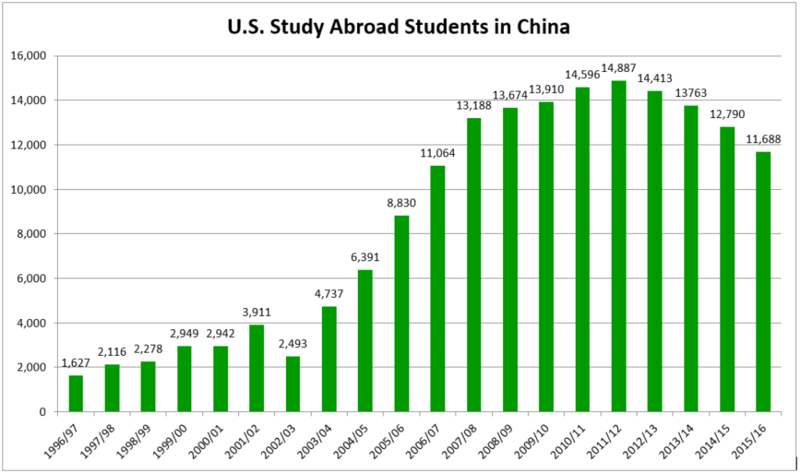 China remained the fifth most popular destination for U.S. students studying abroad during the 2008/09 school year, and it continued to account for 5 percent of U.S. study abroad. In the previous academic year, growth for the PRC as a destination increased 19.0 percent, while study abroad as a whole increased 8.5 percent. But for 2008/09 growth for China was a much smaller 3.9 percent, while the total worldwide figure declined -0.8 percent. Figures for the top four destinations also dropped. The order of the top 10 remained the same as in the previous year, except Mexico and Germany switched places. Japan was in 11th place with 5,784 students, a 1.3 percent increase over the previous year. Taiwan’s total grew 3.3 percent to 597. Hong Kong grew	5.7 percent to 1,155. South Korea grew a dramatic 29.1 percent to 2,062. Singapore grew 7.7 percent to 612. Study in Asia increased slightly. I’ve been doing so much on signage lately that I’ve been neglecting the issue of romanization. (Remember romanization?) Here’s something just in from South Korea, a country that rivals Taiwan in making a national pastime of screwing around with its romanization system. The Ministry of Culture, Sports and Tourism and the Presidential Council on National Competitiveness on Wednesday discussed plans to make the Korean language more accessible worldwide, including working out a Romanization standard for family names, compiling a new Hangul dictionary with about 1 million entries, and building a Hangul cultural center. The government will come up with standard Romanization for family names this year that will become mandatory for people when they apply for new passports and for government offices that use both Hangul and English on official documents such as birth records and residence registration cards. In Taiwan, people can choose among romanization systems for the name on their passport. Employing romanization for Hoklo, Hakka, or a language of one of Taiwan’s official tribes is also permitted. An earlier Romanization project for family names was suspended in 2000 due to controversy over exceptions. The new standard will cost a huge amount of money as the Romanized names of businesses, schools and individuals as well as road signs will have to be changed. A new Hangul dictionary is to be compiled by 2012, adding a large number of words to the last official dictionary published in 1999, which has about 500,000 entries, and adding easy sample sentences. Experts have said that the younger generation have trouble understanding the conventional dictionary, as there are too many difficult Chinese characters in explanations and definitions. The government also plans to compile a multilingual web dictionary comprising about 20 different foreign language sections — such as Vietnamese-Hangul and Thai-Hangul — to help foreigners and Korean nationals overseas. A Hangul cultural center, to be built at a cost of W35.2 billion [US$27.5 million] by 2012, is to give visitors hands-on experience of the Korean language. 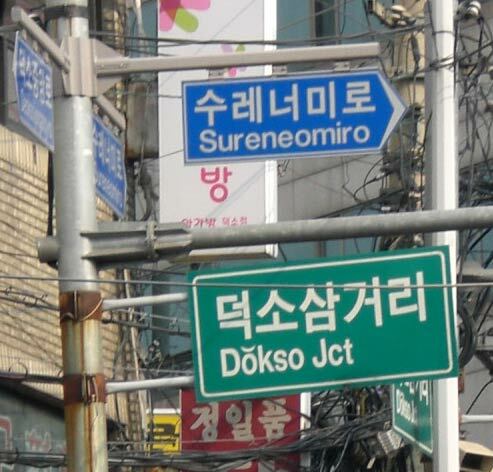 Photo of street signs in Namyangju, Gyeonggi-do (Namyangju, Ky?nggi-do) courtesy of Robert Badger. The final volumes in what is being touted as the world’s largest Chinese character dictionary are scheduled to be published in May. The fifteen-volume work (excluding the index) will reportedly cover some 60,000 Chinese characters and include about 500,000 Sinitic words. By comparison, the Zhongwen da cidian (中文大辭典 / Zhōngwén dà cídiǎn), published in Taiwan in the 1960s covers 49,905 Chinese characters. The project was initiated by the Institute of Oriental Studies of Dankook University, South Korea, in 1978. The first volume of the 『漢韓大辭典 』 (in Mandarin: Hàn-Hán dà cídiǎn; “Dictionary of Chinese characters Korean use,” as it is translated on the institute’s Web site) was issued in 1999. Last year, volumes 10-12 were published. The project has reportedly cost more than W20 billion (US$21.3 million). Yet more work may still be needed. I haven’t provided any news from North Korea in quite some time. Truly, I am wicked human scum whose frantic attempts to stifle the true voice of the people will be thwarted. So here are some remarks from this year from North Korea’s official news agency (found on the Internet on a .jp domain — heh). There are more than 5,000 languages in the world, none of which can compare with the Korean written and spoken languages delicate in expression, rich in meaning and abundant in vocabulary. Part of the reason for this is that Korean, at least as spoken in North Korea, has been rid of lots of foul loan words. Ah, purity! More than tens of thousands of common vocabularies and terminology have been purified from Chinese and foreign words. A lot of inherent Korean words have been discovered and arranged and the Korean written and spoken language has developed into a new system with inherent Korean words as the main. The Korean people are proud of having the Pyongyang cultured language and are embodying in their linguistic life thoroughly. The Pyongyang cultured language is the standard one of the nation, which is fully reflecting the national characteristics and constantly developing in accordance with the requirements of the times. The Koreans are a nation of one and the same blood who have lived in a territory with same culture down through history. They have developed the Korean language into the Pyongyang cultured language, centering around Pyongyang, the hub of the politics, economy and culture, since the liberation of the country from the Japanese colonial rule. The Korean language, with abundant vocabularies, can correctly distinguish the differences between various objects and their meanings and clearly express people’s feelings and emotion, color, taste and etiquette. Its pronunciations are fluent, intonations soft and sounds beautiful. The Pyongyang cultured language comprehends the superior linguistic factors of the national language. In particular, all the words of foreign origin which are difficult to understand have been removed and a vocabulary system has been established on the basis of home-grown words. As a result, the Pyongyang cultured language protects the purity of the Korean language on a high level. Chinese and Japanese words had been brought into the Korean language in the past owing to the flunkeyism of feudal rulers and the Japanese imperialists’ moves to obliterate the Korean language. Foreign words including them have been arranged into Korean ones. China shifting its position on traditional Chinese characters? Many Web sites in China are running the story that Chinese, Japanese, Korean, and Taiwanese scholars have reached an agreement on unification of Chinese characters — and that this involves using many traditional characters. If any “agreement” has indeed been reached, it probably won’t mean much, if anything at all — certainly not to the government of China. But the number of sites running this story and the prominence of some of the members of the PRC delegation make me wonder if this might just be a little more than much ado about nothing. Zhōng xīn wǎng 11 yuè 5 rì diàn jù hǎiwài méitǐ pīlù, shǔyú Hànzì wénhuà quān de Zhōngguó, Rìběn, Hánguó Sānguó hé Zhōngguó Táiwān dìqū de xuézhě juédìng zhìzuò tǒngyī zìxíng (wénzì de xíngzhuàng) de 5000-6000 ge chángyòng Hànzì biāozhǔn zì. Hánguó “Cháoxiǎn rìbào” kānzǎi wénzì jí shìpín bàodào chēng, dì-bā jiè “guójì Hànzì yántǎohuì” shàngzhōu zài Zhōngguó Běijīng chuánméi dàxué lóngzhòng zhàokāi, huìyì yóu Zhōngguó Jiàoyùbù yǔyán wénzì yìngyòng yánjiūsuǒ hé guójiā Hànyǔ guójì tuīguǎng lǐngdǎo xiǎozǔ bàngōngshì zhǔbàn. Huìyì jìhuà jiāng Yuènán, Mǎláixīyà, Xīnjiāpō, Xiāng Gǎng, Àomén xīshōu wéi xīn huìyuán, kuòdà Hànzì shǐyòng guójiā huò dìqū de cānyù fànwéi. Huìyì juédìng zhìzuò gè guójiā dìqū Hànzì “bǐjiào yánjiū cídiǎn”, zhújiàn tǒngyī gèguó shǐyòng de zìxíng. Huìyì hái jiù míngnián zài shǒu ěr jǔxíng dì jiǔ jiè yántǎohuì, gèguó fēnbié shèzhì 3 míng liánluòyuán (yánjiū fùzérén) dáchéng le xiéyì. Jù bàodào, “guójì Hànzì yántǎohuì” yú 1991 nián fāqǐ. Qí mùdìzàiyú, yùfáng Dōngyà guójiā yīnwèi shǐyòng Zhōngguó Táiwān de fántǐzì, Zhōngguó de jiǎntǐzì, Rìběn de lüèzì děng bùtóng xíngzhuàng de Hànzì chǎnshēng hùnluàn, quèdìng chángyòng Hànzì de zìshù, tuījìn zìxíng biāozhǔnhuà (tǒngyī). Běnjiè huìyì yǔ 2003 nián zài Rìběn Dōngjīng jǔxíng de dì-qī jiè yántǎohuì xiānggé 4 nián. Jù bàodào, běn cì huìyì tíyì, 5000 duō ge chángyòng biāozhǔn zì jiāng yǐ “fántǐzì” wéizhǔ jìnxíng tǒngyī, rúguǒ gèbié Hànzì yǒu jiǎntǐzì, jiù jìxù bǎoliú. Chūxí cǐcì huìyì de Zhōngfāng dàibiǎo yǒu Wáng Tiěkūn (Jiàoyùbù yǔyán wénzì xìnxī guǎnlǐ sī fù sīzhǎng, Zhōngguó Wénzì Xuéhuì fùhuìzhǎng jiān mìshūzhǎng), Huáng Dékuān (Ānhuī Dàxué xiàozhǎng, Zhōngguó Wénzì Xuéhuì huìzhǎng), Sū Péichéng (Běijīng Dàxué jiàoshòu), Lǐ Dàsuì (Běijīng Dàxué jiàoshòu); Hánguó fāng dàibiǎo yǒu Lǐ Dàchún (Guójì Hànzì Zhènxīng Xiéhuì huìzhǎng), Lǐ Yīngbǎi (Shǒu’ěr Dàxué míngyù jiàoshòu), Jiāng Xìnhàng (Chéngjūnguǎn Dàxué míngyù jiàoshòu), Chén Tàixià (Rénjǐ Dàxué shǒuxí jiàoshòu), Jīn Yànzhōng (Gāolí Dàxué jiàoshòu); Rìběn fāng dàibiǎo yǒu Zuǒténg Gòngyuè (Zhùbō Dàxué jiàoshòu), Qīngyuán Chúnpíng (qīnshàn bù huìzhǎng); Zhōngguó Táiwān dìqū [sic] dàibiǎo yǒu Xǔ Xuérén (“Zhōngguó Wénzì Xiéhuì” lǐshìzhǎng). This is SPP no. 8, from February 1988. The entire text is now online as a 4.2 MB PDF. And as for reading Chinese characters? Remember, this refers to students at a prominent university. Seventy percent of Korean words including most conceptual and abstract nouns are made of Chinese characters. Terminology used in humanities, social studies and natural science are mostly Chinese characters. It is difficult to understand the meaning of words by pronunciation alone, without learning about the meanings of the Chinese characters that represent them. Words such as “recurrence”, “repatriation” and “homing” contain the Chinese character that stands for “return.” Without knowing that character, you must memorize each of those words separately by sound. Whoever wrote that needs to be sent to the board to write “Chinese characters are not words” one hundred times. But I don’t know what it would take for the author to realize that learning words by sound rather than Chinese characters is entirely normal — exactly what native speakers of languages the world over do. For a little more information on the complications in the use of Chinese characters with Korean, see Asia’s Orthographic Dilemma by William C. Hannas, especially the sections on the so-called homonym problem and the supposed transitivity [of Chinese characters] across languages. See also Occidentalism’s thread on this, which already has more than thirty comments.